Happy Beauty Week Sarah Fans! No, I had no idea either but luckily Fenwick are on the ball and sent across a thoughtful bag of goodies in celebration. Between Monday May 12th and Saturday May 17th they’re hosting a week of special offers, daily live beauty demonstrations, new product launches and one-off master classes with some extremely knowledgeable industry professionals. These make-up artistes will be showcasing their skills to help the people of Newcastle revive their beauty regimes. Clearly Spring is the perfect time for dusting off the cobwebs and starting afresh with your make up, skincare or haircare routine. The visiting make up artists differ from day to day; Monday saw YSL international make up artist Fred Letailleur, followed by Tuesday’s stint of Bare Minerals’ Sadie Fennel. Thursday will bring Lancôme national make up artist Marc Sinclair and then on Friday we’ve got a double whammy (I cringed a little as a typed that) of both Sisley national make up artist Paulina Siembor and Laura Mercier national make up artist Chris Howells. Then rounding the week off with Dior’s Martin Aitken on Saturday. Nice work. Unfortunately my day job and important business, such as attending weddings, will likely keep me away from most of these but I may pop down on the Saturday to see what’s going down. As I mentioned Beauty Week coincides nicely with some new product launches and the lovely faces at Fenwick were kind enough to gift me an assortment of these to have a play with so keep an eye out for a few reviews cropping up as I get round to sampling each product. The two most notable being the new fragrance from Viktor & Rolf, because we already know I love the Flowerbomb scent, and the EOS balm. Bonbon, the new V&R perfume, is an extremely sweet scent which I’m informed has ‘the sweetness of caramel running through it’ adding to the ‘mandarin top notes’ and the ‘woody base notes of sandalwood and cedarwood’. Yeah… What they said. The EOS (Evolution of Smooth) lip balm is exciting because it’s been nigh-on impossible to get hold of one of these babies in the UK these last few years and I’ve loved the ones I’ve had brought over from the US. Finally I’m going to be able to pick one up on my doorstep as Fenwick have started stocking them in their famous Beauty Hall. Seriously, this stuff keeps your lips ultra soft, the packing is sturdy and aesthetically pleasing and it’s totally tasty. For the full review of my first EOS balm see here. 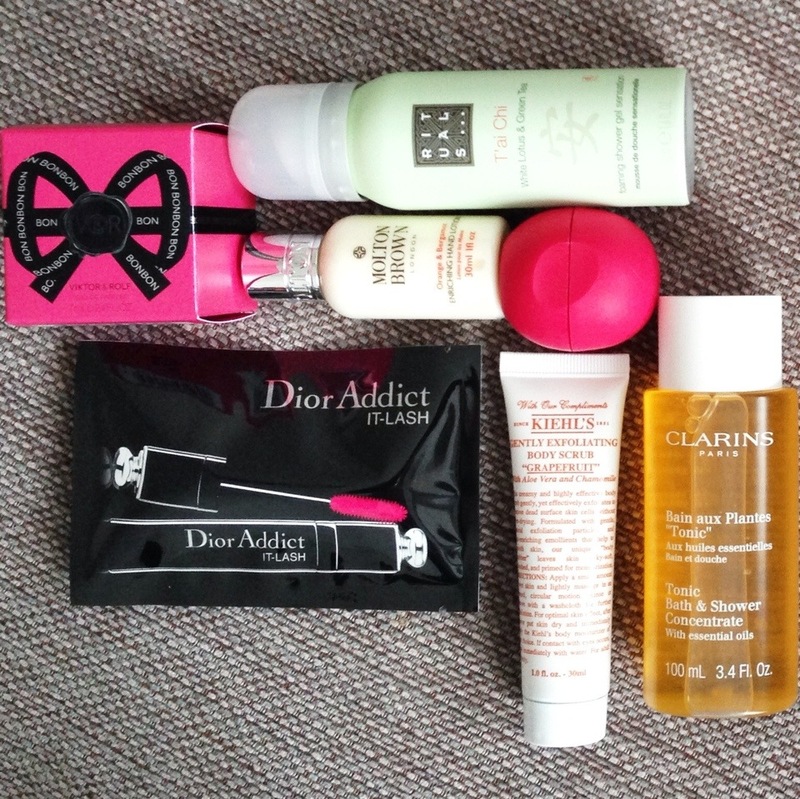 Some of the other products included a Kiehl’s exfoliating body scrub, an AMAZING smelling Clarins bath tonic and the new Dior Addict It-Lash. This isn’t actually out until May 28th but I’m keen to try it as Dior mascaras tend to be fabulous so I’ll report back on that one. Whether your skincare routine needs an overhaul or your make up collection could do with a few new additions Fenwick’s Beauty Week seems like a good enough reason as any (and let’s face it, any excuse to treat oneself is a good one, hey?) so if you’re having a mooch down to the Beauty Hall this week I may well see you there. Check out the Fenwick twitter and Instagram accounts for updates on this and other events.